The Goal is one of Amazon CEO’s Top Three! 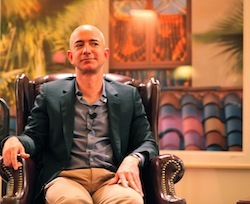 reveals the three books his top Amazon executives read. for sketching out the future of the company. The Goal introduces the Theory of Constraints and is changing how America does business. The Goal continues to be one of the most widely used and recommended business books of all times, as reported by Time Magazine, Slate Magazine and more. It has sold more than 3 million copies, been translated into 21 languages and produced into a 45-minute movie, and been taught in more than 200 colleges and universities. Based on the best-selling book by Eli Goldratt, The Goal Movie shares the inspiring story of Alex Rogo, who uses the principles of the Theory of Constraints like bottlenecks, throughput, and flow balancing to transform his mediocre division into a money-making machine. the groundbreaking book The Goal on audio CD read by an ensemble cast. This entry was posted in Articles, Books, Materials, TOC.tv, Videos and tagged amazon's founder and cel.jeff bezos.The goal, books, cnbc's, Eliyahu Goldratt, interview. Bookmark the permalink.